A proposal backed by some residents of Monhegan would force the relocation of the Aqua Ventus test site, essentially forcing the eight-year project to start from scratch. 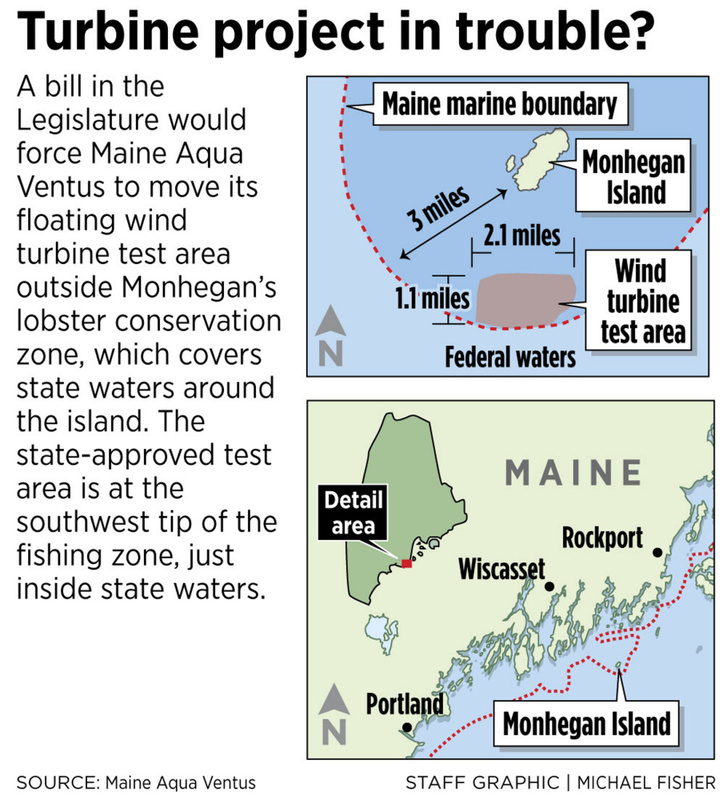 A bill aimed at moving a wind energy test site farther from Monhegan Island would have the practical effect of ending Maine’s bid to build the country’s first commercial-size, floating wind turbines, according to a federal Department of Energy official. Musial was commenting on a measure that would force the relocation of the Maine Aqua Ventus project. The University of Maine-led venture has spent years surveying wind and wave patterns, marine life and bird migration at a site in state waters, nearly 3 miles southwest of Monhegan. Based in part on the data collected, the project has received $10.7 million in energy department funds and is eligible for an additional $40 million. If the project can win permits and secure enough money, the Aqua Ventus team hopes to begin testing a pair of floating turbines in 2019. But a bill now awaiting a hearing in the Legislature would ban any offshore wind energy project within 10 nautical miles of the Monhegan Lobster Conservation Area. The wind project site is located at the southern edge of the lobster zone. A spokesman for a group of island residents behind the bill said the university is responsible for the crisis by changing the scope of the project. What started in 2009 as a scaled-down, temporary experiment has grown to a 20-year, full-scale project with blades that would reach 576 feet above the waterline and an undersea cable to the mainland, at Port Clyde. A project that size, said Travis Dow of Protect Monhegan, can’t help but impact the view for tourists and artists, who drive the island’s summer economy, and the experience for birders, who flock in spring and fall for annual migrations. The conflict is taking shape just as ocean wind power ambitions are ramping up along the East Coast. The nation’s first offshore wind farm went online last year off Rhode Island. Both New York and Massachusetts are seeking power from big wind ocean farms. These projects would be in shallow water, with turbine towers set in the sea floor using conventional technology used in Europe. Maine Aqua Ventus is pioneering the next generation of wind energy – floating concrete platforms in deep water, far from land, where winds are steady and people can’t see them. Musial said that while a few floating platform designs are being tested in other countries, Maine Aqua Ventus is the only one in the United States and is using a technology unique in the world. “This has the potential to create a whole new industry in the United States,” he said. The bill, L.D. 1262, was printed last week and has yet to be scheduled for a committee hearing. In the coming weeks, Maine lawmakers will have to decide whether the short-term concerns of 30 or so year-round Monhegan residents and their supporters outweigh the project’s long-term economic and energy potential, at least for the foreseeable future. The eight-year journey to this crossroads is long and convoluted. But these are some high points. The Monhegan test site was selected through a state-run process that included locations off uninhabited Boon Island and Damariscove Island. Monhegan was picked because it’s 12 miles from the mainland, has steady winds, a limited number of fishermen and extreme electric rates. The 2009 law that designated the site allowed up to two turbines, a maximum capacity of 25 megawatts and one transmission cable. In early meetings with island officials, though, the university promoted a one-third scale turbine, with no cable, and a test period of months. But over time, the scope of the project changed. Engineers decided to test a one-eighth scale model of the concrete platform off Castine, in more-protected waters. Maine Aqua Ventus also won an energy department award for commercial-scale testing. That led to an upgraded design for two, 6-megawatt turbines on full-size platforms off Monhegan, with a cable to the mainland and the island. To sort through the proposal, residents formed the Monhegan Energy Task Force. Members watched the Maine Public Utilities Commission approve a 20-year power contract in 2014. Then the project lost a bid for more federal funds, and the sense of urgency evaporated. A year later, a competitor for the federal grant fell away and the project was back on track. Protect Monhegan formed last fall, after it became clear that the full-scale project might become a reality. Dow said at the time that the group was quickly able to raise $40,000, some of it from visitors and summer residents. It hired a veteran public affairs consultant, Ted O’Meara, and Jon Doyle, a former assistant attorney general. There’s debate on the island over how many of the 65 year-round residents support the group. Others are more interested in negotiating a community-benefits power deal. At 70 cents per kilowatt hour, island electric rates are among the highest in the country and five times above mainland averages. Either way, Doyle’s law firm drafted the bill and the group asked Sen. Dana Dow, R-Lincoln (no relation to Travis Dow) to sponsor it. Asked his position on the bill, Dana Dow expressed the view that moving the project likely would kill it, but said it was his job to submit proposed laws for residents of his district. The lobster conservation area earmarked in the bill is roughly 30 square miles and surrounds the island. It was created by state law 20 years ago to set aside an exclusive fishing ground for island residents. In 2009, the university asked Monhegan lobstermen to map the part of the zone where they did the least amount of fishing. They identified a sector on the southwest tip, along the 3-mile state boundary. That’s where Maine Aqua Ventus established its test site. According to the university, the site now is among the most extensively studied in the Gulf of Maine. But Travis Dow contends that past studies – such as ones done for migrating bats and birds – aren’t relevant now, because the blade height and rotor diameter have increased so much. He said the studies need to be redone, so they might as well move the project to Boon Island, 6 miles off York, or Damariscove, 5 miles off Boothbay Harbor. But Jake Ward, the university’s vice president for innovation and economic development, said the federal grant money is linked to the Monhegan site. That sense was confirmed in an email to the Press Herald from the Department of Energy. The department said that an ongoing federal environmental review process needed to approve the project is site specific, meaning that changing the project’s location may require additional baseline surveys. Moving the project outside the 3-mile state boundary into federal waters, the department added, would trigger an entirely new siting process by the Bureau of Ocean Energy Management. The energy department plans to decide whether to award Maine Aqua Ventus up to $40 million in final funding early in 2018. To gather public input, federal officials came to Maine in late February and early March for meetings in Tenants Harbor and on Monhegan. In its email response to the Press Herald, the department didn’t indicate how it would react if the project were forced to move. But Musial, who has worked with the university on the engineering details since 2009, said Maine Aqua Ventus is part of an advanced demonstration program and has received investment and government resources over the years that wouldn’t be replicated at another location. “It would have to start over as an independent, commercial project, if the site was moved,” he said.